What’s The Oldest Thing in Your Wardrobe? What’s the opposite of fast fashion? Fast fashion is impossibly fast lead times, impulse buys, clothes hanging in wardrobes with the price tag still attached, quick turnarounds and unloved clothes in bin bags waiting for their inevitable trip to landfill. It’s trend after trend after trend; each making the one before feel old, obsolete. It’s expendable, throwaway and bereft of a story or any real connection. So the opposite of that? It’s that piece hanging in your wardrobe year after year. Worn in, worn out, cared for and renewed. It’s the thing that has defied trends. It’s pulled threads, stitched up holes and patches. It’s a dress or a skirt or a coat or a bag that evokes memories and carries stories. I’ve owned other pieces in my wardrobe longer than this shirt, but it certainly claims the title of the oldest thing in there at over 40 years old. It first belonged to my Nana who, to be completely honest, I used to think had terrible taste. She was Austrian and lived between there and Germany as I grew up. Each Christmas she would, very kindly, send us clothes as gifts – a sequin top and cardigan set and a jumper stand out in particular – and as an ungrateful child with a very distinct sense of personal style, I would turn my nose up at all of them. I thought it was all terribly uncool and, by proxy, thought that my Nana was too. When she visited, she would spend an enormous amount of time in the bathroom getting ready, and it became a bit of a running joke. But it didn’t occur to me that this routine was the result of an equally distinct sense of personal style. It was just my Nana being fussy and making me wait to get into my own bathroom. She died when I was 17 and, as I got older and began to realise, as we all do, that grandparents and parents are real people with real lives, emotions and histories, I wondered more about who she’d been. She was active, independent and, as it turns out, stylish AF. Before old photos and slides emerged for me to pore over and admire, this shirt found its way to me. When I put it on for the first time (it fit like a glove) my Nana became someone else to me; a young woman who used fashion as a means of expression, who wasn’t afraid to stand out. A young woman just like me. 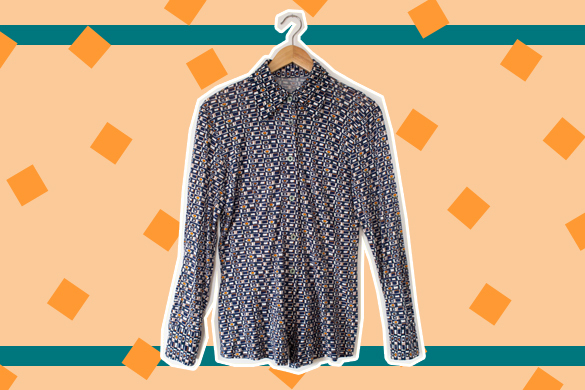 This shirt is more than its exaggerated collar and its lively print, it’s a hint at a part of a life I never knew. Vicky Smith, founder of Earth Changers: “So here’s my favourite scruffy old black sweatshirt. I think it’s celebrating its 30th year in my wardrobe! It was bought from Miss Selfridge (which was super-cool) in around 1987 when I was 15. It cost about £12, I think. Looking back, we didn’t have half as many clothes shops then (especially in Bradford!). There was Miss Selfridge, Chelsea Girl, Top Shop, Dorothy Perkins and something called ‘Now’ (was that even national?!) as well as department stores: M&S, Debenhams and C&A. We have so much choice these days, and so much fast-moving fashion but then it was literally a new collection at the start of a season and that was it, until the next season at least. Rae Ritchie, freelance writer: “The summer of 1998. The greatest cover song ever was released (Kung Foo Fighting by Bus Stop feat. Karl Douglas, obviously). My mates and I began hitting the pubs and clubs (well, club singular) of our provincial home town. I started reading Vogue. I got my first job, collating coach holiday brochures and school prospectuses in a family friend’s printers. The latter two gave me the social and financial capital to begin building my ultimate wardrobe for the start of sixth form college in the September. I remember all the key components so well. My Prada-esque nylon bag and block heeled ankle boots. The skinny fit athleisure fleece and flat-fronted purple wool trousers with a kick flare. The grey ribbed cardigan with self-coloured velvet trim that I always thought passed for Marni. There was also the slim fit white shirt, purchased from Next for £45 – probably twice what the same item would cost from that store today. This was a time when George Davis’ original vision for the brand still lingered and prices were high. Alec Gilroy’s granddaughter in Coronation Street wore their cherub pattern jumper as code for her middle-class status. My new super chic friend Frankie worked there. To my sixteen year old mind, the shirt served as a massive signifier of who I was and who I wanted to be. I loved that shirt. I had the dressmaker down the road add slits for cufflinks (also purchased from Next. Purple and silver. £12 from their menswear department), believing that this signalled my burning feminism and small scale rejection of gender norms. I’d love to hear your stories too, whether it’s a beaten up old jumper, a threadbare scarf, or a well-loved jacket. Tell me about the oldest thing in your wardrobe in the comments section below or say hello on Twitter. The oldest items in my wardrobe are from my mom. I have this excellently plaid (blue, red, black) wool maxi skirt and a few of her belts from the 70s and 80s—and I love them. Items I thought were hideous 10 years ago now have a newfound allure! They sound great! Isn’t it funny how our tastes change?! Everything comes back around eventually which is perhaps yet another for argument for giving clothes a long life. That is awesome, old photos are so special!